C.C.F. 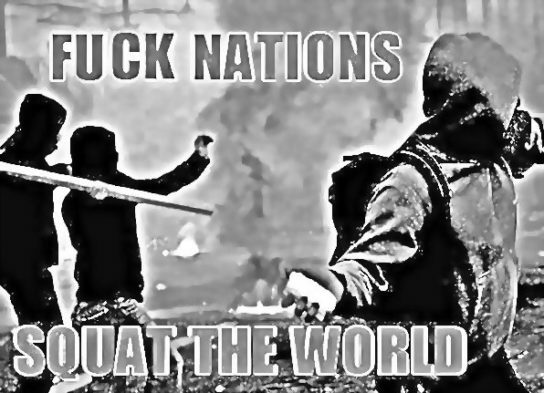 – SQUATS – THE HOUSES OF ANARCHY. Some thoughts on the invitation sent by the comrades of Papamichelaki Squat, of Teflon Library, of Radiofragmata and of Continuous Deconstruction, about the Squatting issue. The following text corresponds to snapshots and features that we can find in the current squats in Greece. “Property is theft” says one of the oldest anarchist slogans. It is the theft of collective life, it is the abolition of community, it is the refuge of taking distance from the commons, of fear. Property and its twin sister power, gives birth to the distinction of people based on titles, positions and privileges… Just like the sky has no borders, the land should not be owned. Squats have begun as a form of denial of property, and of self-organised expression. The course of the squat movement has many shades… Some of them are more militant, others are more harmless… There are anarchist squats and alternative squats, squats which are cores of lawlessness and squats which are dehydrated cultural centers. The anarchist squats ought to be a thorn for the repression mechanisms, against every dominant expression of the existing system. All things considered, they ought to be thorns against the social norm, against the alienated everyday life of decay that the social norm itself produces. En el contexto de la circulación de debates y propuestas en torno a las okupaciones y espacios antiautoritarios, compartimos algunas reflexiones, experiencias y propuestas en el marco de la campaña “A la mierda las naciones – Okupa el mundo!” propuesta por compas de Grecia [1, 2, 3], buscando propagar la crítica y autocrítica en la lucha contra el poder, a siete años de la muerte del compañero anarquista Mauricio Morales. The well-regulated normality of social life within systems of power is not the product of a one-dimensional strategic perception that follows a determined path, but on the contrary it’s the totality of many well-thought and tested logics, tactics and practices. It’s a fact that power would not be what it is today, had it not been in a constant process of self-evolution covering previous deficiencies and weaknesses in the management of social tolerance of its followers. It is not accidental that there have been and continue to appear entire political and philosophical currents that examine the necessity of power structures within human societies. Through the constant appearance of experiments, studies and dissertations, a series of political and scientific think-tanks arm the hand of power with more and more specialized methods that ensure social tolerance. It’s been about four months since the action campaign of Black December finished. The subversive experience of Black December and the density of anarchist action that developed was a springboard for fermentation and discussions for the reconstruction of anarchist methods in an informal shape. The actions in reference to Black December have continued until today, while cycles of discussions in and out of prisons have reached a number of conclusions, proposals and positions, that have as a common reference point the desire for intensification of our attack on the sites of power.